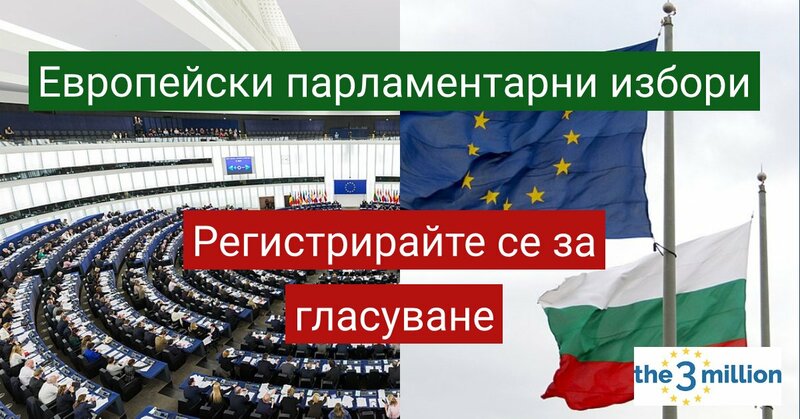 Стъпка 1: Регистрирайте се за гласуване до 7 май. 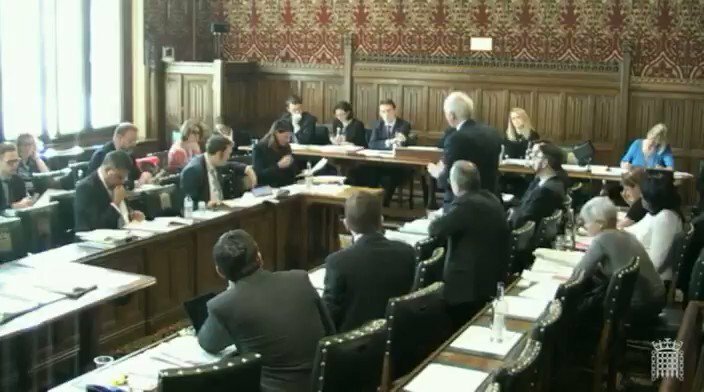 Deutsche & österreichische Bürger*innen in Großbritannien können im Mai an den Wahlen zum Europäischen Parlament in GB teilnehmen. In diesem Thread erklären wir, was Ihr JETZT tun müsst, um in Großbritannien wählen zu können. Schritt 1: Meldet Euch bis zum 7. Mai zur Wahl an. 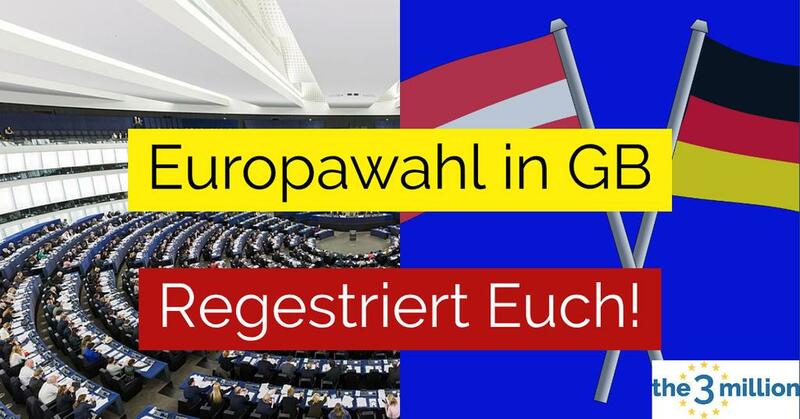 Schritt 2: Ladet das Wählerregistrierungsformular für die Europawahlen herunter & füllt es aus. Schritt 3: Sendet das Formular bis zum 7. Mai an Euer lokales Wahlbüro. b) es bis zum 7. Mai an Eure örtliche Wahlbehörde schicken (Schritt 3). @DavidTCDavies Dear @DavidTCDavies, this is not new. 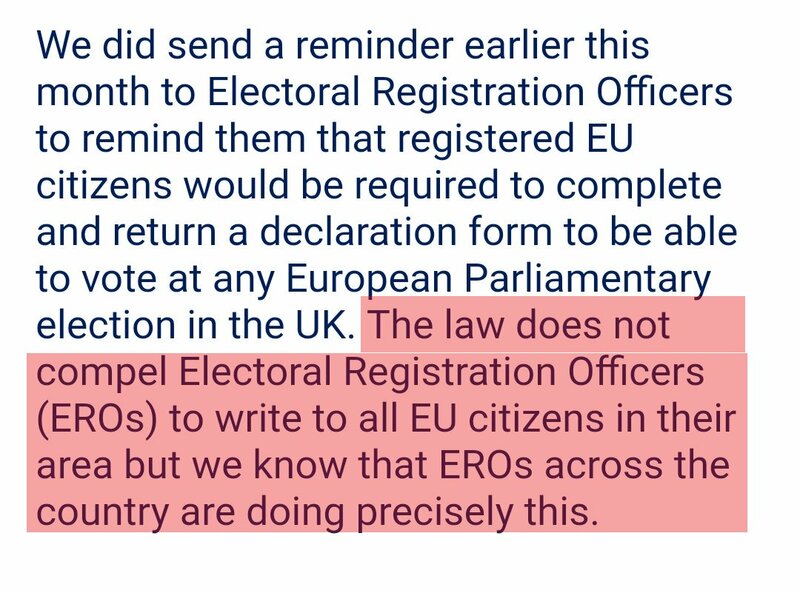 Actually, at the last European Parliament elections many EU citizens were disenfranchised exactly because local authorities did not send them the form they seem to be sending out this time. "We will be following this up in our post-election review and ensuring that electoral registration officers are aware that they must send this form." 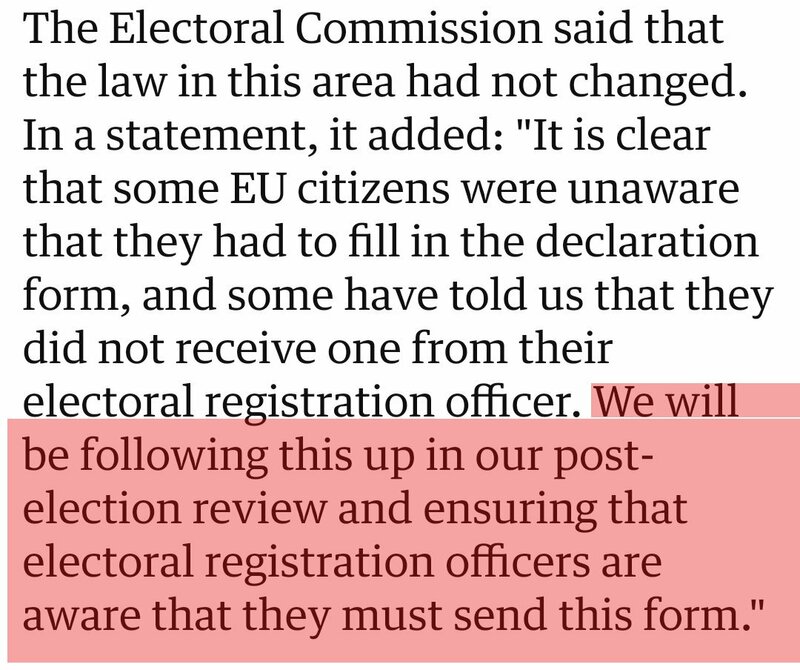 Reform Committee also picked this issue up - especially the fact that many EU citzens were disenfranchised as they were not informed about having to fill in extra form for EU Parliament elections. 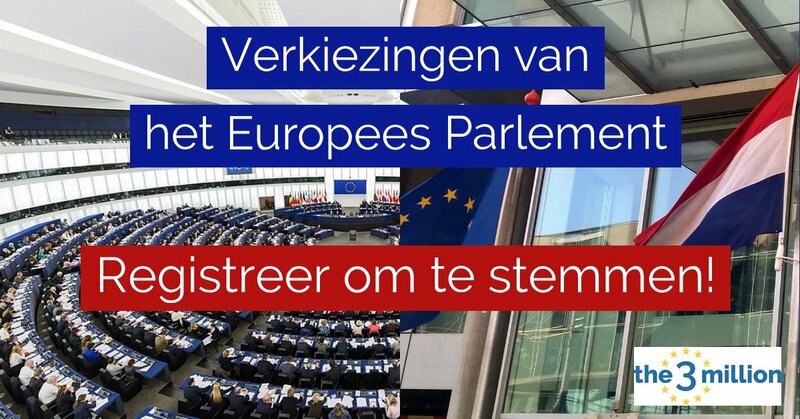 EU-burgers kunnen stemmen in de Europese Parlementsverkiezingen in mei. Hier in deze thread leggen we uit wat je NU moet doen om in het VK te kunnen stemmen. 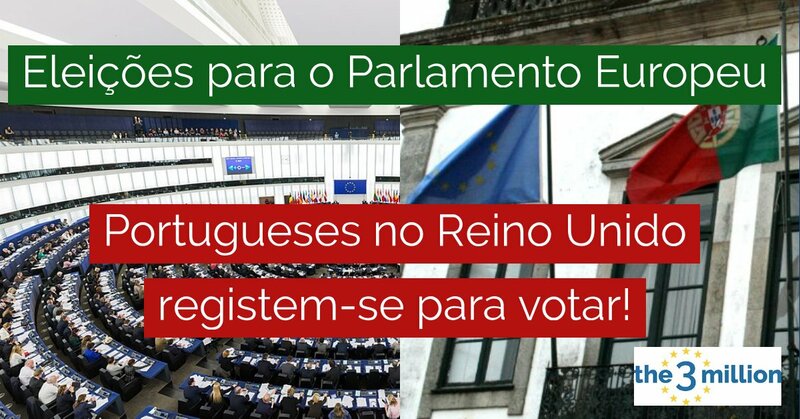 Todos os cidadãos da União Europeia residentes no Reino Unido, incluindo todos os cidadãos de Portugal, podem votar nas eleições europeias de 23-26 Junho no Reino Unido. Aqui explicamos o que devem fazer para votarem no Reino Unido. o registo eleitoral para as eleições para o Parlamento Europeu é diferente do registo para as eleições locais britânicas. Mesmo que já esteja inscrito no Registo Eleitoral britânico é necessário efetuar os passos seguintes. 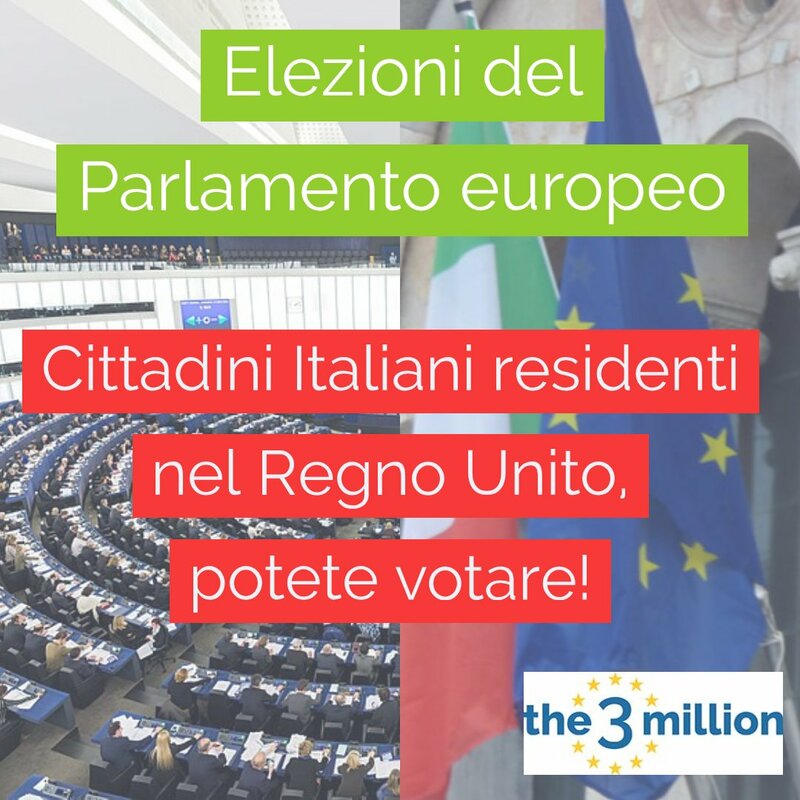 Tutti i cittadini dell’Unione Europea residenti nel Regno Unito, quindi tutti i cittadini Italiani, possono votare nelle Elezioni Europee del 23-26 Maggio dal Regno Unito. Qui spieghiamo quello che devi fare per votare nel Regno Unito. Nawet jeśli jesteś już na liście wyborców (electoral register), nadal musisz wykonać kroki 2 i 3 przed 7 maja, by móc głosować w UK. 1. 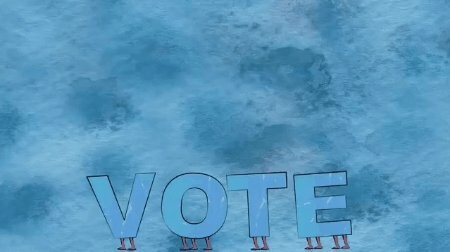 Înregistrați-vă la vot înainte de 7 mai. 2. 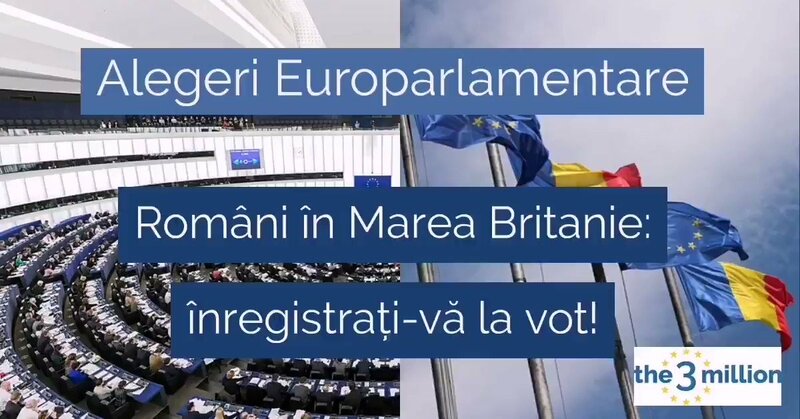 Descărcați și completați formularul de înregistrare pentru alegerile Europarlamentare. 3. Trimiteți formularul biroului local pentru înregistrarea electorală înainte de 7 mai. 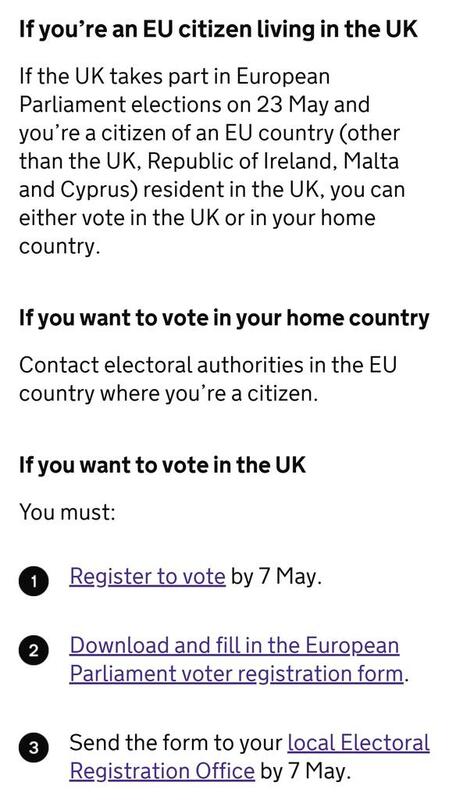 EU/EEA citizens in the UK can vote at the European Parliament elections in May. Step 1: Register to vote by 7 May. Step 2: Download and fill in the European Parliament voter registration form. Step 3: Send the form to your local Electoral Registration Office by 7 May. The Govt has published the final list of 50 Document Scanning Centres to help EU citizens with Settled Status applications. This is for citizens who either lack an Android phone or the technical know-how how to use it. 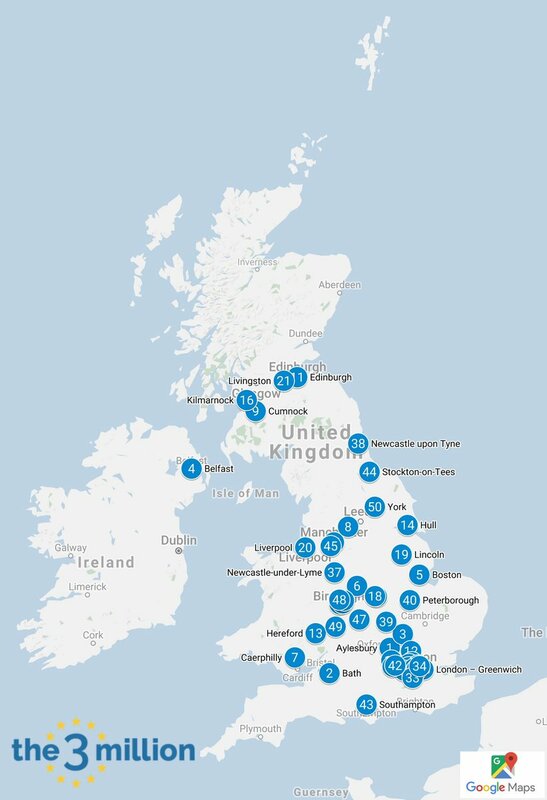 2/ Though we are grateful that @ukhomeoffice has opened these 50 Document Scanning Centres our internal analysis shows that this is simply not good enough. We've mapped the centres against all UK post codes & the findings, despite contrary Home Office promises, are disappointing. 3/ The avarage round trip to get to one of these Document Scanning Centres is 55 miles. 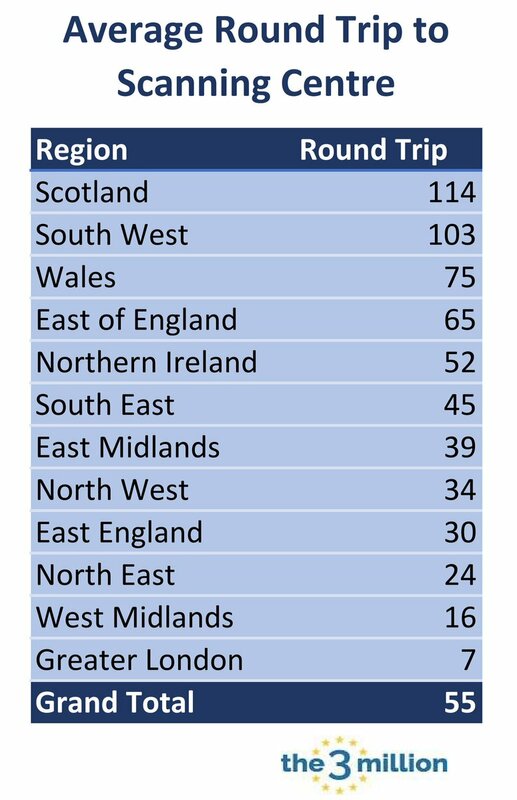 For Scotland and the South West the average round trip is over 100 miles. 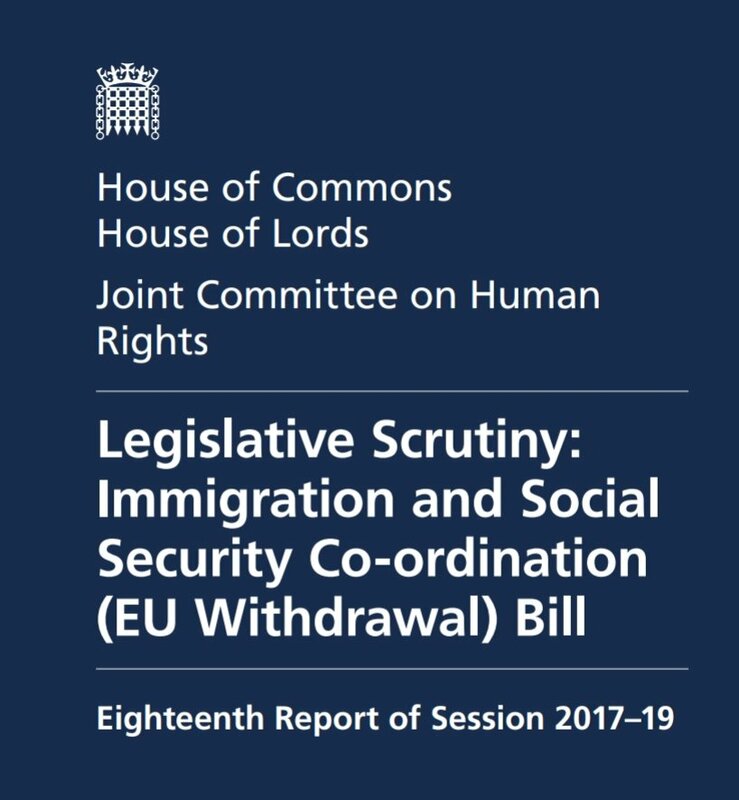 1/ Today the Joint Committee on Human Rights published its report on the Immigration Bill, Settled Status & the Common Travel Area. It mirrors many grave concerns we have been raising for months. Very worrying reading for EU citizens in the UK. 2/ One of our biggest concerns has been that the Immigration Bill, as it stands now, will remove the legal basis of the #citizensrights of the 3.6m EU citizens in the UK without providing adequate replacement in law. 3/ Although [Govt] has said that it's not its intention to strip EU Citizens [...] of their rights, that is the effect of this Bill as it stands. [...] Neither is it adequate simply to offer weak protections in policy statements or 2ndary legislation, which are changed regularly. 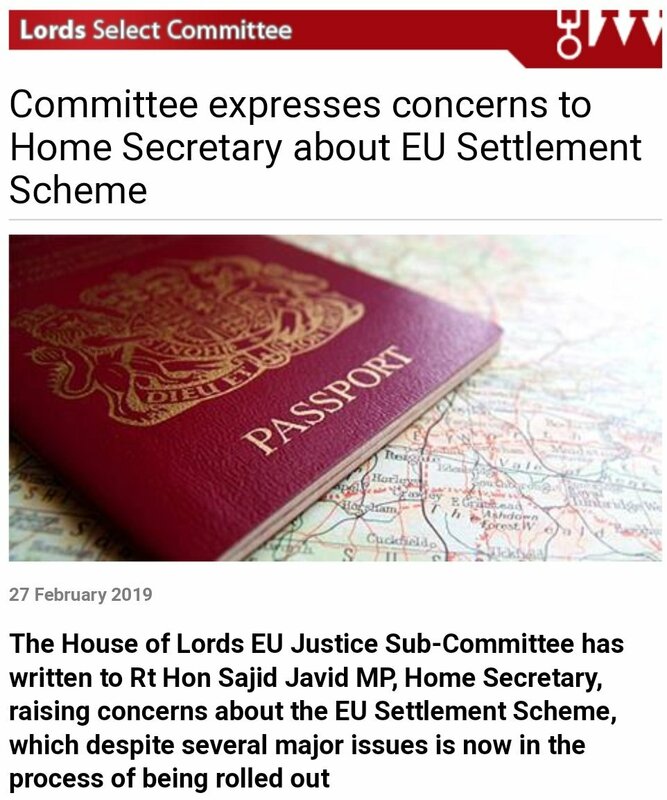 The House of Lords EU Justice Sub-Committee has written to @sajidjavid, Home Secretary, raising concerns about the Settlement Scheme for EU citizens. 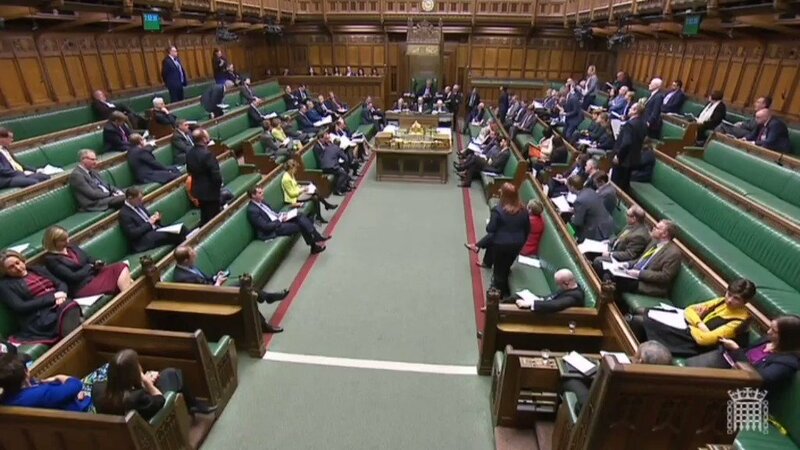 The House of Lords Select Committee criticises that publicity for the Settled Status scheme for EU citizens in the UK has so far been inadequate and ill-judged. The House of Lords Select Committee criticises that the Settled Status application process is not accessible to all, and there are potential barriers that could deter EU citizens from applying. 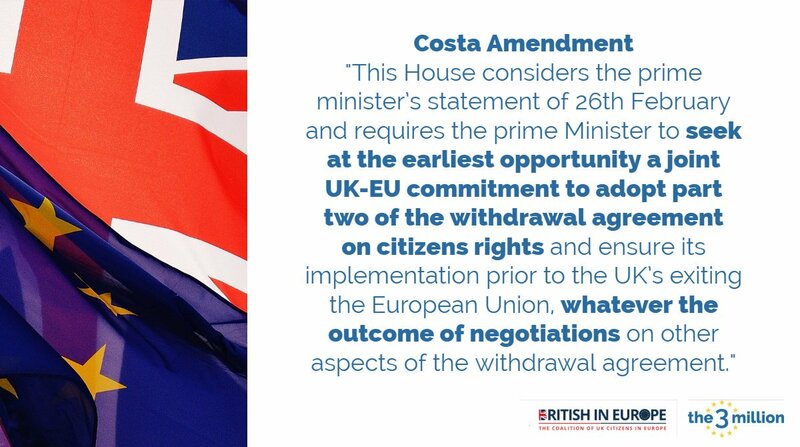 The #CostaAmendment has been published. 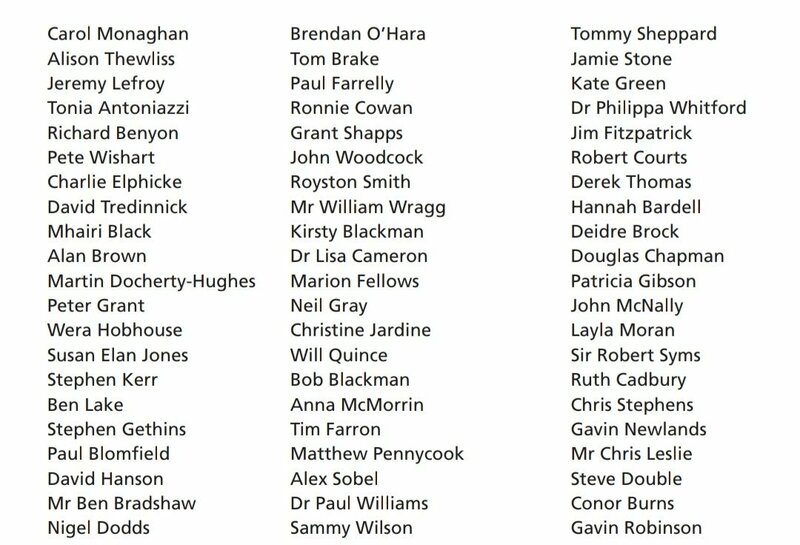 An impressive 141 MPs have signed. With such big backing we are confident that @HoCSpeaker will select the amendment for vote, which will happen before 7pm today. YOU can still help to make it a success! 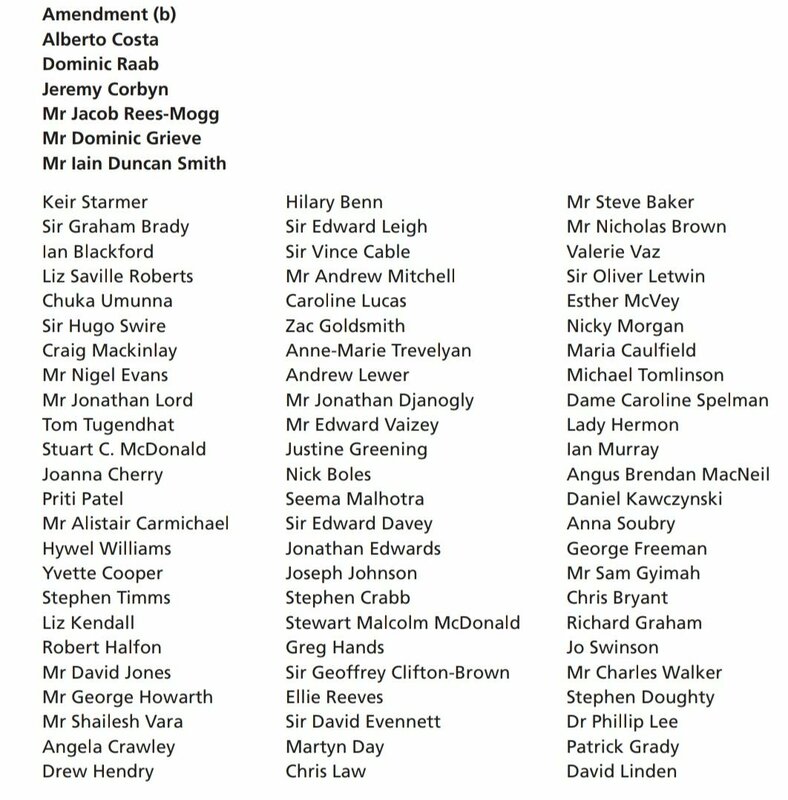 Please check the list of MPs and see if your MP is on it. 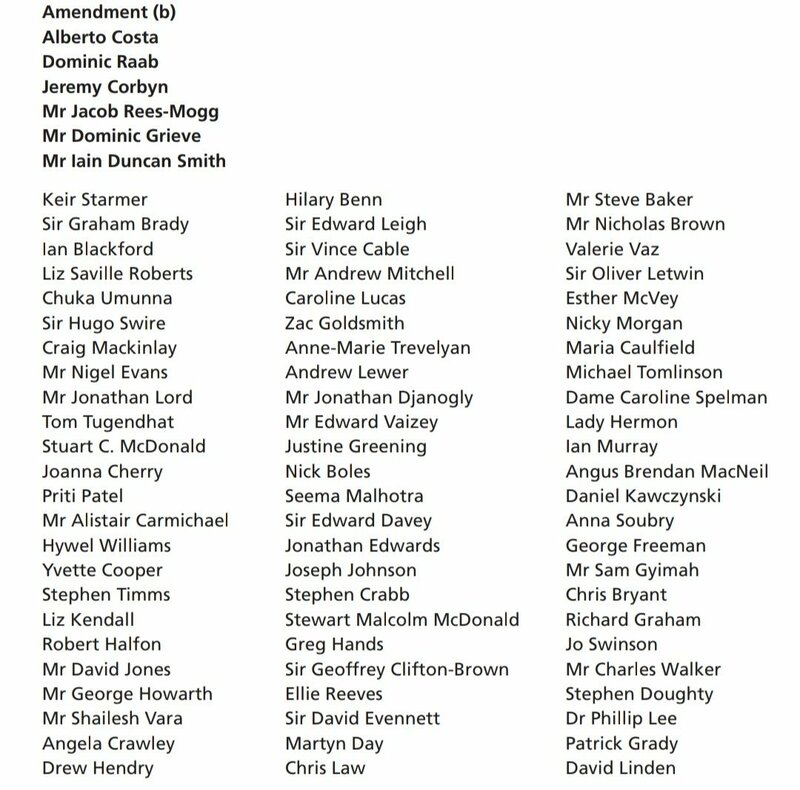 Just because your MP not being on the list does not mean he/she won't vote for it. They simply haven't signed it. If your MP isn't on the list then ask them by tagging them here on Twitter to vote for the #CostaAmendment tonight - using the picture below. 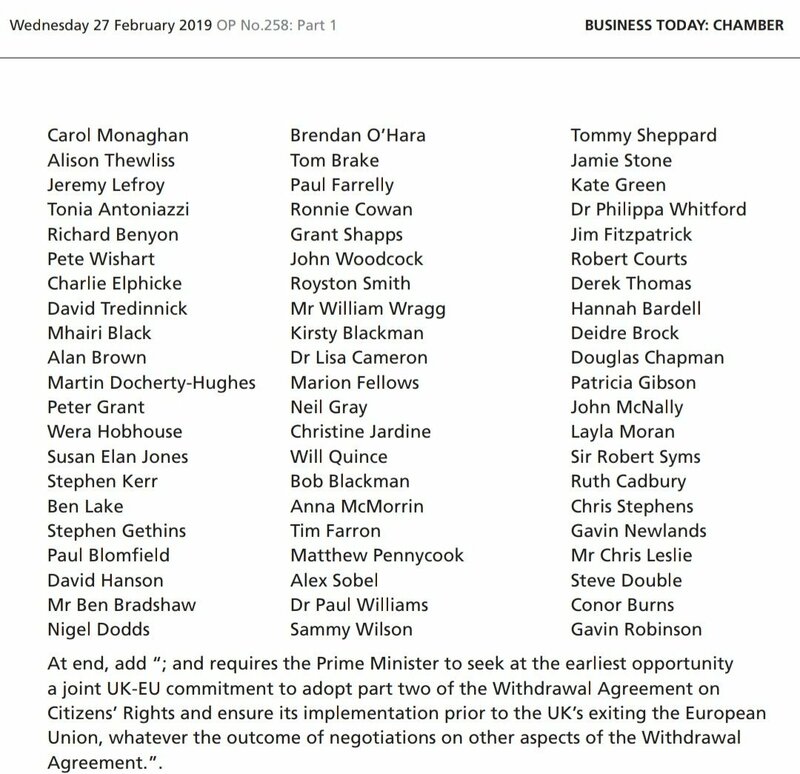 As you can see it has broad support from all parties - both Leave & Remain. So don't fear to tag your ERG MP, they are suportive. It is wrong of @number10gov to say that ring-fencing of #citizensrights has to happen outside Article 50. The EU has the authority to do so within Article 50 as @smismanss lays out here. Maybe reading up would help the UK Govt to understand. 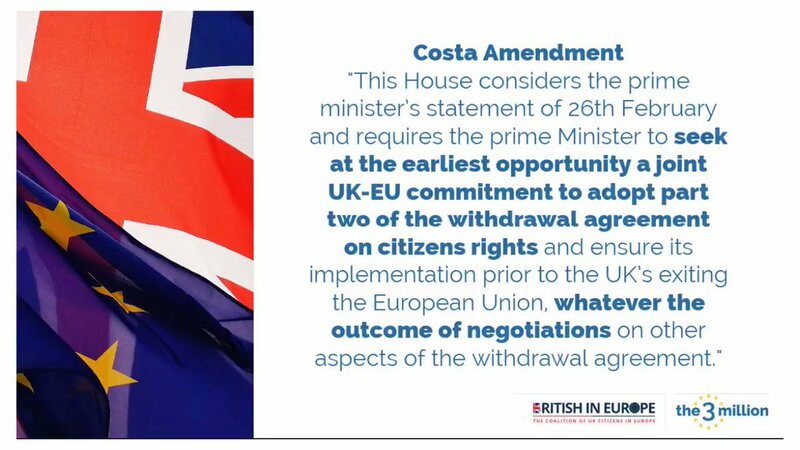 So rather than hoping that the #citizensrights of the @BritishInEurope & EU citizens in the UK will be magically resolved by unilateral 'guarantees' the right thing for MPs to do tomorrow is to support the Costa Amendment that would force the UK Govt to seek this EU mandate. 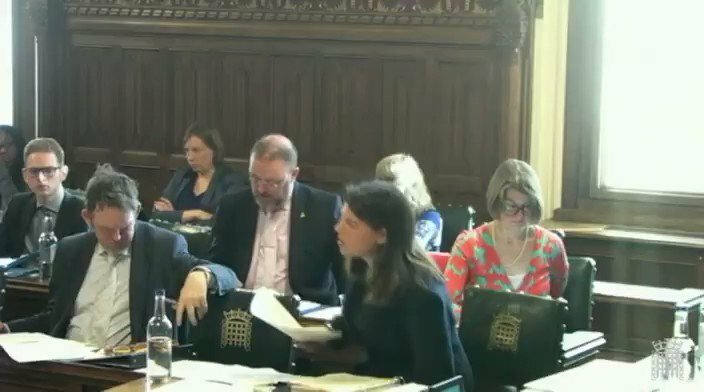 Breaking: Following question by @NickyMorgan01 in the House of Commons this afternoon Home Secretary @sajidjavid signals that Govt is willing to discuss @AlbertoCostaMP amendment which would mandate the Prime Minister to seek ring-fencing of #citizensrights with EU. It's now time to push the Costa Amendment on EU/UK ring-fencing of #citizensrights to protect EU citizens in the UK & @BritishInEurope from the potential fallout of a no-deal Brexit. It is not to late to write to your MP. Do it now! Write to your MP today using writetothem.com. 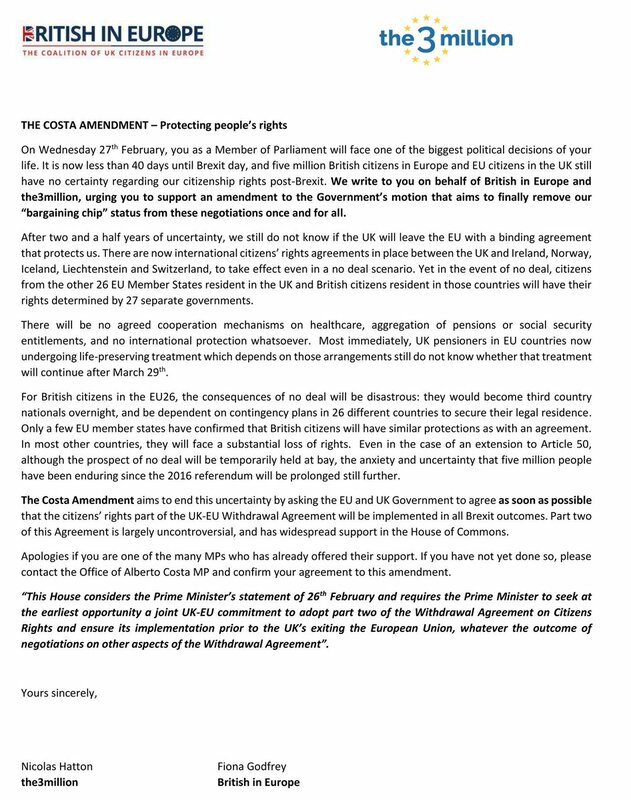 Just put in your postcode and tell your MPs why they must support the Costa Amendment on #citizensrights. Do you live in Hackney, Holborn or Islington? We need you to write to your MPs (Abbott, Starmer & Corbyn) and ask them to support the Costa Amendment on ring-fencing #citizensrights for EU citizens in the UK & @BritishInEurope. It's simple and takes no more than 5 minutes. Just go to writetothem.com, put in your postcode & write why they must support the Costa Amendment. We have written to all MPs to urge them to support this amendment, proposed by Conservative MP @AlbertoCostaMP, which would mandate the Prime Minister to seek, with the EU, a bilateral agreement on the #citizensrights for EU citizens in the UK & @BritishInEurope. 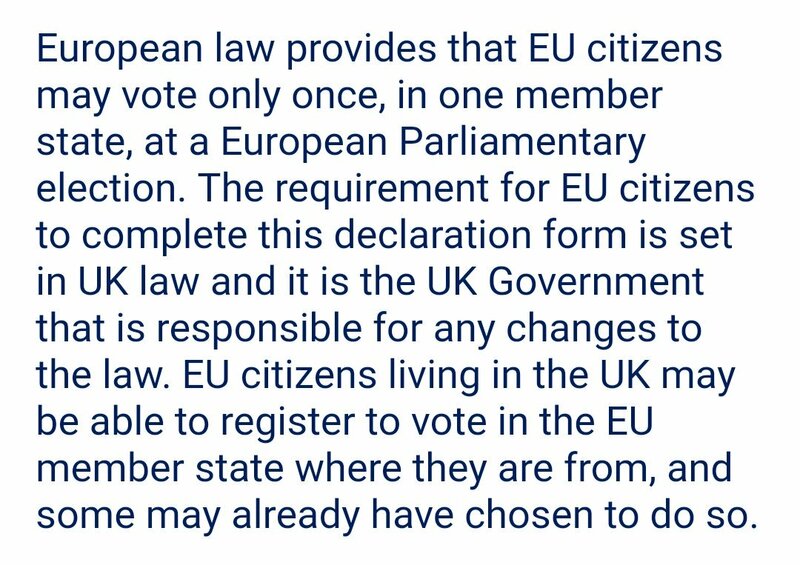 1/ On @RemainiacsCast today @IanDunt mentions the Costa Amendment on #citizensrights. 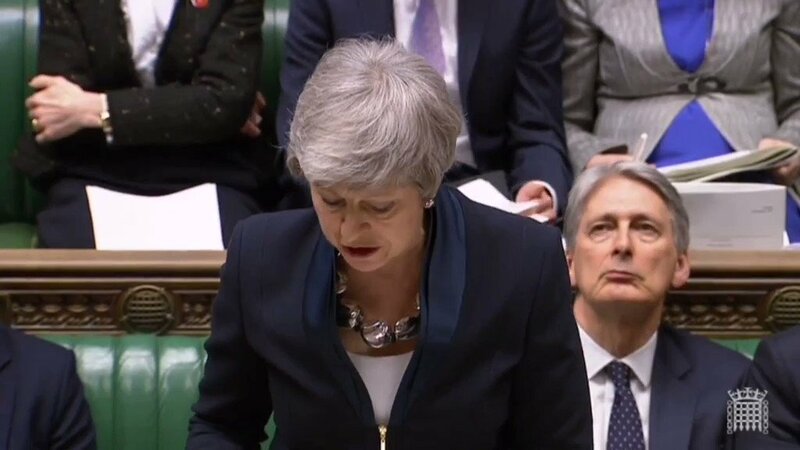 A crucial amendment that would mandate the Prime Minister to seek ring-fencing, rescuing, the citizens' rights part of the EU/UK Withdrawal Agreement with the EU. 2/ The amendment on #citizensrights is gaining momentum in Westminster but we need you to write to your MPs to ask them to support it. 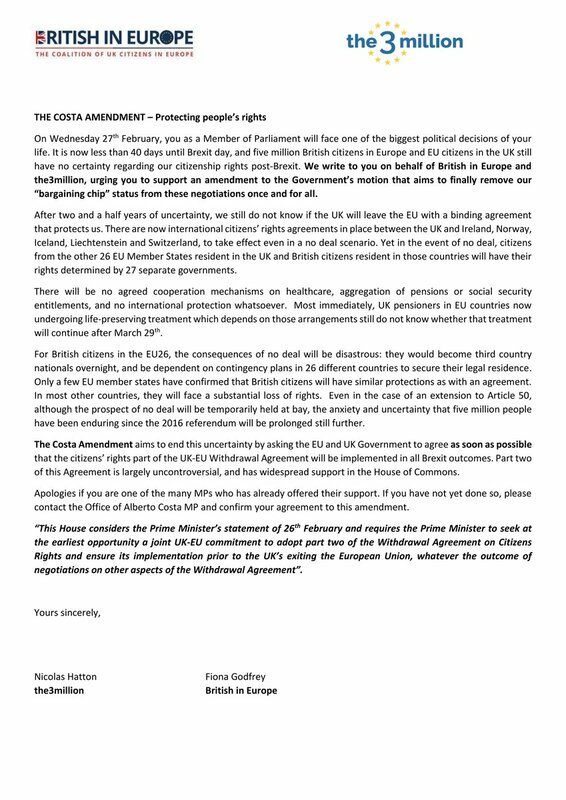 We have written to all MPs today to urge them to support this amendment, proposed by Conservative MP @AlbertoCostaMP, which would mandate the Prime Minister to seek, with the EU, a bilateral agreement on the #citizensrights for EU citizens in the UK & @BritishInEurope.